On the door of this machine installed a toothed disc,on which there are two toothed rings with steel teeth.On the main shaft installed a movable toothed disc, on which there are movable teeth. The movable teeth on the movable toothed disc are arrayed with the fixed toothed rings in a staggering manner. When the main shaft rotates at a high speed, the movable toothed disc runs at the same time, so material which enters the crushing chamber is crushed under the comprehensive function of impacting, shearing and abrading of he material itself and between the teeth and the material. The finished products, after sieving through the mesh sieve, enter the collection bag from the crushing chamber; andcoarse material will be crushed once again. 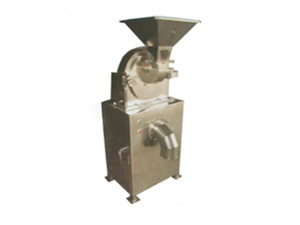 This machine features of novel structure, smooth operation, low noise and high yields. If the machine is used for crushing poisonous material or precious material, the user shall contact our company for detailed production circumstances prior to use.